Here is quickly and simply improve the look of your cracked or stained garage floor without the preparation and hassle of messy liquid coatings. 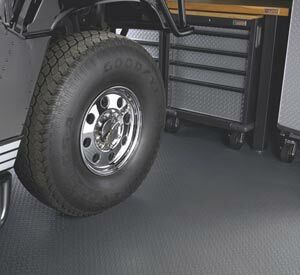 Check out the newest wave in garage floor finishing is roll-out vinyl floor mats. Much like the resilient flooring used in kitchens, the mats are available in 8-foot-wide rolls up to 36 feet in length. Ususally three 8-by-24-foot rolls will cover a double garage floor. 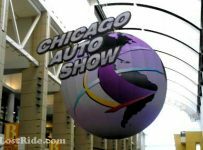 According to Gladiator Garage Works, which introduced this product in 2007, once the mats are installed they will not creep, tear or wrinkle in normal use, even under the weight of automobiles. Edges, especially those facing the garage doors could be vulnerable to curling and casual damage. Gladiator claims that a bead of silicone applied under the edges prevents the mats from lifting and keeps water from seeping in. This non-porous and chemical-resistant material withstands common spills and the temperature extremes of the garage. When it’s time to clean the floor covering, simply sweep it off. This may be a better alternative for extremely cold climates where the liquid coatings have a very hard time setting up.